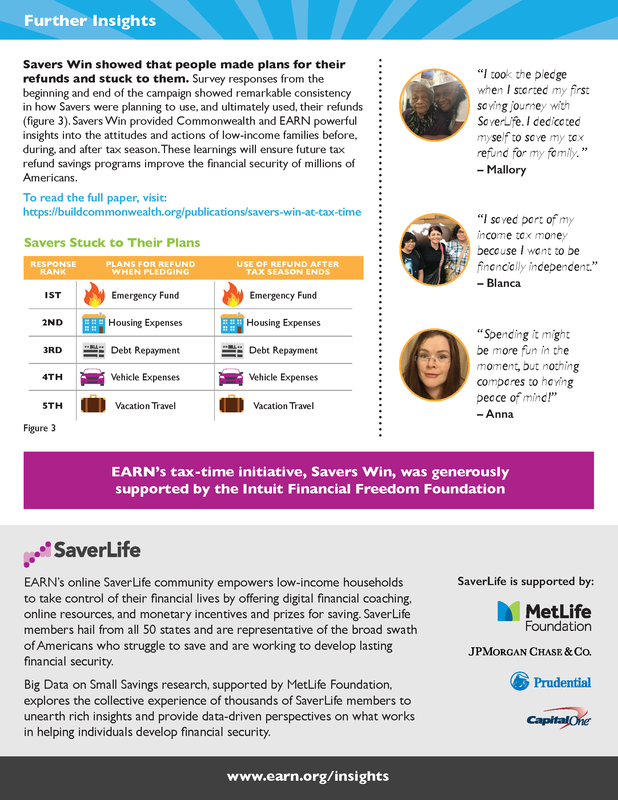 In 2018, EARN and Commonwealth launched Savers Win, a campaign to encourage low-income families to save their tax refunds. To win cash prizes, Savers pledged to save their tax refunds by direct depositing a portion into an account linked to SaverLife. The results were positive. Over 9,000 individuals, many of whom were new to SaverLife, pledged to save over $2.4M in tax refunds. Of survey respondents, 65% said the pledge influenced what they did with their refund, and 54% said the chance to win a prize influenced what they did with their refund. Transactional data confirms what Savers said. Twenty-three percent of Savers who pledged to save deposited their refund directly into a linked savings account, versus 9% for the entire Saver population (see figure 1). This shift in activity can have a significant impact; EARN’s June 2018 Big Data Brief showed that refund money stored in savings accounts tends to last much longer than refund money kept in checking accounts. Another key learning was that people have different definitions of “saving,” especially in the short-term, where savings are often used to smooth income fluctuations. Figure 2 shows remarkably similar responses from Savers answering very different questions. Some saw themselves as saving for upcoming expenses, while other said those same types of expenses made it impossible for them to save. Savers Win showed that people made plans for their refunds and stuck to them. Survey responses from the beginning and end of the campaign showed remarkable consistency in how Savers were planning to use, and ultimately used, their refunds (figure 3). 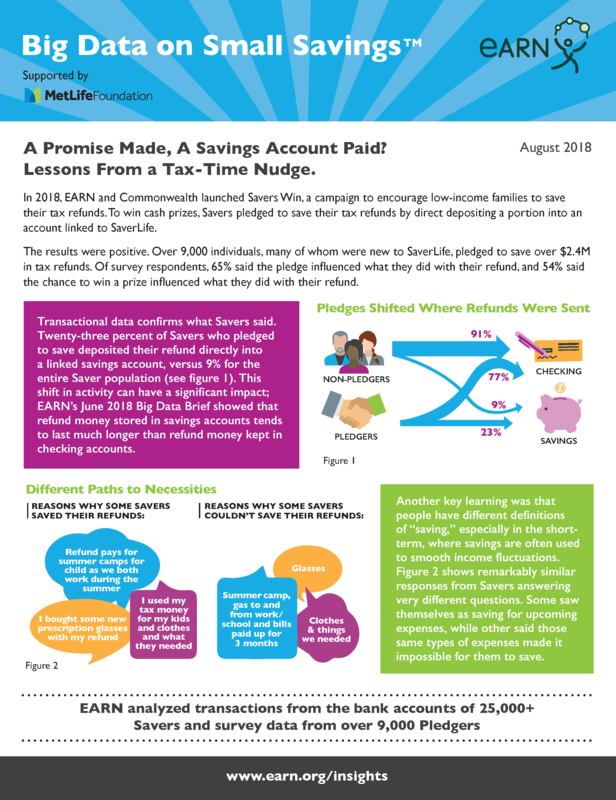 Savers Win provided Commonwealth and EARN powerful insights into the attitudes and actions of low-income families before, during, and after tax season. These learnings will ensure future tax refund savings programs improve the financial security of millions of Americans. To learn more, read Commonwealth's full publication: "Savers Win at Tax Time: Testing Digital Strategies to Promote Tax Time Saving." Want more insights? Please join our research newsletter. You can also read more of our research and learn how EARN impacts our Savers' lives.